Utility, industrial and commercial customers reply on digital metering solutions for highly accurate power quality monitoring and reporting. This enables the reliable and efficient use of energy within their operations. Advanced communications and logging capabilities, as well as flexible installation options, provide the application flexibility for both green field and brown field digital metering installations. 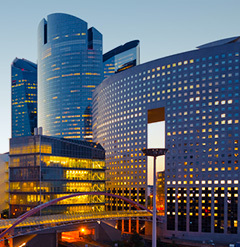 With a wide range of offerings, GE provides high accuracy power quality, power meters and sub-metering solutions, as well as meter enclosures and powerful energy visualization, analysis and reporting software. EPM 9900P High Performance Power Quality and Transient Recorder Meter High accuracy power quality monitoring and transient waveform capture, and reporting data. 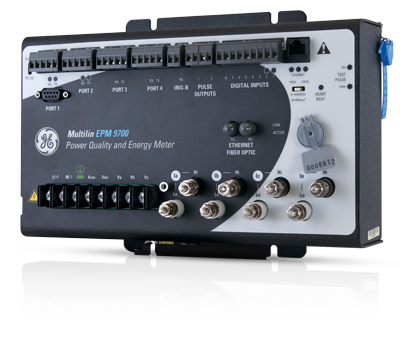 With up to 4GB of data logging, including 50 MHz transient capture, the EPM 9900P ensures that essential power quality data and events are captured, stored, and time synchronized allowing for comprehensive analysis of events. EPM 9800 Advanced Power Quality Metering SystemPrecision Measurement, Advanced Communication, Basic PQ and Alarm Reporting, Economical Recording Meter. The socket type mount design EPM 9800 meter is perfect for industrial and utility substation automation applications where both power quality monitoring and revenue accuracy are required. EPM 9700 High Performance Power Quality Metering with Advanced Logging and Communications The EPM 9700 is a high performance IEC 61000-4-30 Class A Edition 3 power quality meter with innovative logging and communication features ideal for utility, industrial and commercial applications. It provides a comprehensive overview of power quality and consumption empowering users to capture and reconcile key power quality events to make educated operational decisions quickly. The EPM 9700 is an enhanced, direct retrofit upgrade replacement for existing installations of the EPM 9450/9650. EPM 9650 Advanced Power Quality Metering SystemHigh Performance Power Meter and Data Acquisition Node. Perfect for industrial, commercial and utility applications, among the advanced features the EPM 9650 supports are Transformer Loss Compensation, onboard time of use and high speed waveform capture. The EPM 9650 includes increased memory capacity for data logging, and optional EN50160 Flicker and compliance monitoring. EPM 9450 Advanced Power Quality Metering System High Performance Power Meter and Data Acquisition Node. Perfect for industrial, commercial and utility applications, among the advanced features the EPM 9450 supports are Transformer Loss Compensation, onboard time of use and high speed waveform capture. Meter includes all the attributes required for highest level of PQ analysis and communication. EPM 7000 Power Quality Meter The EPM 7000 meter provides revenue class (0.2%) three phase power metering with optional Ethernet, relay, status, and analog output communication modules. This flexible meter can be used for a wide range of high accuracy applications including disturbance recording and power quality studies. PQM II Power Quality Metering System Continuous Metering of three-phase systems with waveform and data logging. The PQM II is a digital metering device that provides continuous monitoring of a three-phase system. It provides metering of current, voltage, real and reactive power, energy use, cost of power, power factor and frequency. EPM 6010 Building Automation Power Meter The Multilin EPM 6010 is a revenue grade power meter with native BACnet/IP communications. This meter is designed to integrate seamlessly into existing and new building management systems using the popular BACnet protocol. 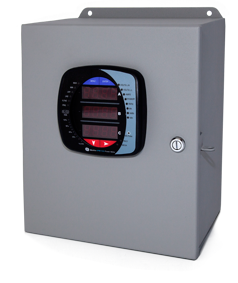 The meter allows users to gather data on voltage, current, power and energy usage throughout a facility. EPM 6000 Multifunction Power Metering System Multifunction Power and Energy Meter. EPM 6000 is the industry's highest performance revenue grade panel meters. Based on the latest technology and an all-new platform, the EPM 6000 has a superior cost to performance ratio and significantly outperforms other metering products many times its price. EPM 4600 Multi-Feed Power and Energy Metering Solution The Multilin EPM 4600 Multi-feed Power and Energy Meter is a submetering solution that allows owners and operators to quickly, accurately and centrally measure power and energy usage of specific areas to reduce operating expenses. The EPM 4600 provides comprehensive data logging and trending capabilities and includes a broad range of communication options including Wi-Fi, Ethernet RS485 or USB for easy integration in both existing or new infrastructures. EPM 7100 Energy Submeter with Data Logging and WiFi The EPM 7100 is a powerful tool for monitoring and managing energy usage within factories, businesses and across campuses. EPM 7100 features 0.2% accuracy, as well as RS485, RJ45 Ethernet or WiFi communications. The extensive data logging and alarm recording capabilities of the EPM 7100 enable advanced analysis and predictive maintenance of the power system. EPM 6100 Energy Submeter with WiFiThe EPM 6100 is a powerful tool for monitoring and managing energy usage within factories, businesses and across campuses. EPM 6100 features 0.2% accuracy, as well as RS485, RJ45 Ethernet or WiFi communications. Early detection of power problems is facilitated through THD and the alarming capabilities of the EPM 6100. Pre-wired & Configured Metering Solution GE’s Multilin Meter Enclosures enable customers to extend existing switchgear metering or install new metering capabilities. As a factory pre-wired, configured and stand-alone solution, high accuracy energy and power quality metering can be added without expensive and time-consuming design changes or downtime, enabling energy management initiatives and cost savings. 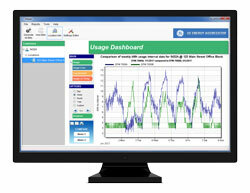 Energy Aggregator Visualization, Analysis & Reporting Software GE's Energy Aggregator software is a comprehensive energy reporting, billing, usage/cost analysis and visualization solution to improve energy management and efficiency. Designed to work with GE's advanced EPM Power Quality Meters, Energy Aggregator allows facility managers to effectively manage energy ownership through automated meter data collection and visualization of energy data, and enables fair billing and reporting for financial environmental incentives.